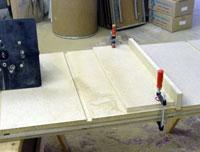 Here is a quick method to space shelf dado's on longer uprights using a 3/4" stop block and a 3/4" spacer board. We used MDF to construct the storage units. The uprights are 12" x 77 1/4" x 3/4". The top and bottom pieces plus all the shelves are 12" x 23 1/4" x 3/4". 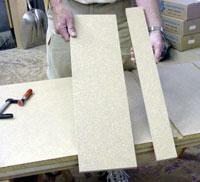 Start by cutting the 97" x 49" x 3/4" MDF sheet to 77 1/4" long. Rather than cutting the uprights to the final width now, cut the sheet in half so you can end up with a piece 24 7/16" x 77 1/4". This makes it easier to handle. We ripped the uprights to width after the dado's were cut. We cut the rabbet on each end of the uprights plus one dado on the table mounted router using a 3/4" diameter straight bit. The depth of cut is 3/8". 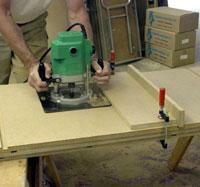 Clamp the fence across the table top so the 3/4" width of the cutter is fully exposed. Cut a test piece and adjust the fence to get the proper fit if necessary. We used the router in a hand held position to cut the remaining dado's. Fit a 2" x 24" x 3/4" stop block in the dado. Measure the distance from the edge of the base plate to the edge of the bit, then cut a space board to width so the total adds up to 12". This will give a 12" spacing between each dado. 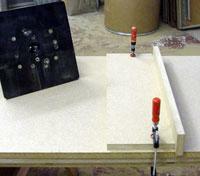 Rest the board against the stop block and clamp it to the upright. Remember the bit is now moving in a clockwise direction, meaning it will pull the plate to the left as you cut. 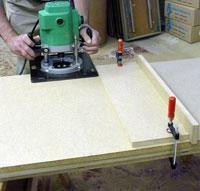 After the dado's are cut, rip the upright and shelves 12" wide on the table saw. We glued and nailed the back on and then used a 1/4" round over bit with a hand held router to edge the shelves.